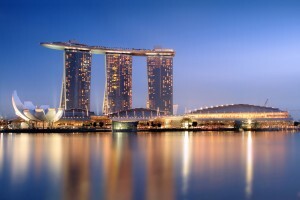 Marina Bay Sands Pte Ltd., the company that operates Marina Bay Sands, one of Singapore’s flagship integrated resorts, has expressed interest in launching a gambling venue and convention complex in Thailand. Krist Boo, Vice President for Communications for the company, told media that they would like to build and operate an integrated resort in Thailand, if they are given the necessary approval. The property would be quite similar to the one in Singapore. In other words, it would include facilities intended for meetings, conventions, exhibitions, and incentive travel, aside from a casino venue. However, the gambling operator needs to be given a permission by the government of Thailand and to have its project approved by residents of the country. Reportedly, Thai legislators are currently considering the possibility to introduce a casino act in the country and thus, allow the gambling operator to build its venue. It seems that Marina Bay Sands officials had previously met government representatives to discuss the casino proposal. Yet, according to local media, their plan had been turned down. However, there are certain lawmakers that are pushing for a casino to be opened on the territory of the country. They have pointed out that this would result in reduced illegal gambling. The Thai Finance Ministry is reviewing a plan for the construction of an entertainment complex, located on a site formerly used by the country’s State Railway. Ms. Boo commented that Marina Bay Sands would like to build an integrated resort in Thailand, as the country is one of Asia’s most popular tourism destinations. She also said that her company would like to locate its property somewhere near an international airport. The potential construction of a casino in Thailand has its opponents, as well. The President of the Thailand Incentive and Convention Association, Sumate Sudasna, recently commented that his country should rather focus on its culture, in order to attract more visitors. Annually, more than 30 million international tourists enter the country. As mentioned above, being a subsidiary of gambling operator Las Vegas Sands, Marina Bay Sands manages one of the two integrated resorts on the territory of Singapore, with Resorts World Sentosa, run by Genting Singapore, being the other one. It seems that the company is looking to expand its operations in other Asian countries, as well.